friday archive dive! (a different sort of topic) | i made it so. i decided to make that pumpkin soup after all. served with some warm homemade bread, it was just what i needed on a chilly afternoon. as for this week’s archive dive, i thought we’d do a different kind of cue. instead of a specific topic, let the photo below inspire your dive. i’m so curious to see what you come up with this time. for the new followers and subscribers (hey everyone, welcome! i hope you like it here! ), the archive dive is a way to give old blog posts a new life. each friday, i post a topic. find a blog post you’ve written that relates to the topic and share it with us here. you can use the archive dive button (code on the right, scroll down) on your blog to let others know. if you don’t have a blog, read along, visit others and follow the common thread amongst us. entries keep rolling in ’til monday so check back over the weekend for new posts. This entry was posted in friday archive dive, in the kitchen and tagged friday archive dive, pumpkin soup. Bookmark the permalink. love the twist :) and you inspired me to roast sugar pumpkins! I have two just waiting for when I have time. Beautiful photo! 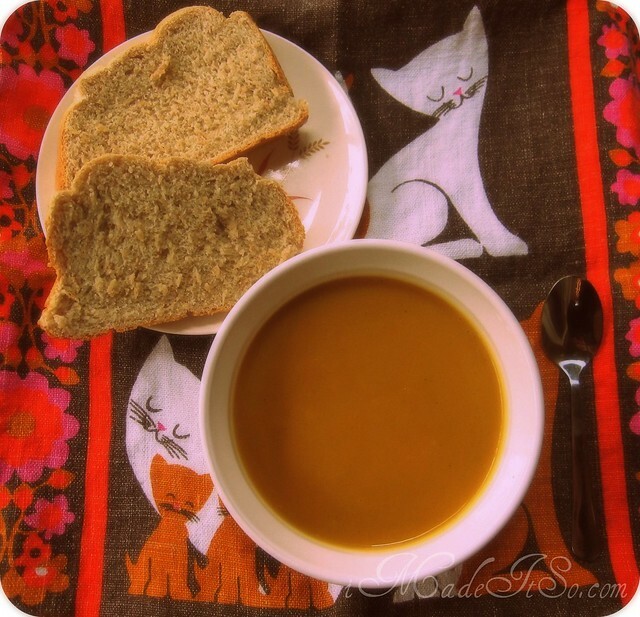 Now I’m craving pumpkin soup and homemade bread. I only wish the rest of my family enjoyed soup! What’s a sugar pumpkin? Hi Tara! Sugar pumpkins are smaller than the ones we buy to carve, and have a higher sugar content – sweeter taste. It’s supposed to be better all around for cooking (taste and texture) than a regular pumpkin. I found them at a local farm, but some groceries stores probably sell them too. I’ve heard them called pie or sugar pumpkins. Hope that helps! thanks abby! i’ve only ever heard them called pie pumpkins here. they are sweeter and i find they roast up nicer than larger pumpkins cut into pieces to roast. I can’t think of a relevant post of my own to share but oh how I love your table cloth!! thanks corey! the lunch was to go, sort of… it’s actually a tea towel on a tray. i’m planning on my own soup/bread photo/post next week. darn, if only i had that time machine. **not to say that your bread and soup don’t look delightful. add a glass of wine, and i think i like your photo better.